Poet and broadcaster Mona McTavish Gould was born in Prince Albert, Saskatchewan, but spent most of her life in Ontario. She showed precocious talent, publishing poetry throughout her teens in a section of The Globe and Mail called “The Circle of Young Canada.” At nineteen, she moved to St. Thomas, Ontario, where she become a reporter and later an editor for the social pages of The London Advertiser and the St. Thomas Times Journal. She married St Thomas native Graham Gould in 1929 and gave birth to their son, John, later that year. Throughout the 1930s, Gould published poetry and articles in numerous journals including Chatelaine, Saturday Night, Canadian Forum, The Montrealer and Canadian Poetry. She was heralded as a promising poetic talent by the likes of E.J. Pratt and B.K. Sandwell, then editor of Saturday Night. The family lived in St. Thomas and later in Owen Sound. When Graham enlisted in the army in 1940, she moved with her son to Toronto, where she quickly found work in advertising and public relations. Her clients included The Red Cross and General Motors. Tasting The Earth, Gould’s first book of poetry,was published by MacMillan of Canada in 1943. This contains her most famous poem, “This Was My Brother,” which was written after the death of her older brother Howard at Dieppe. It still appears in schoolbooks and anthologies. At war’s end, the family settled in Owen Sound for several years, and Gould continued to contribute columns to several Ontario newspapers as well as to New Liberty magazine and Saturday Night among others. Her second book, I Run With the Fox, was published with MacMillan in 1946. A third, entitled Gossip, was published in conjunction with Gossip magazine in 1949. That same year, Gould was hired as a broadcaster for CKEY and moved with her family back to Toronto. Over the course of the next decade, she had three programs: Listen Ladies, Carousel and Be My Guest. A widely recognized public figure in Toronto at this time, she interviewed Eleanor Roosevelt, The Andrews Sisters and Louis Armstrong, among many others. Gould was widowed in 1959. She remained active in promotions work for various organizations and eventually became editor of Gossip; however, her working life slowed with the advent of television, and within a few years she had all-but faded from the public eye. This troubled period came to a close in the 1990s. In her new home in Barrie, she began speaking to groups of students and seniors, and once again found a sense of security and importance. She lived to be ninety-one, and, despite failing eyesight, wrote a poem a day until the day before her death. 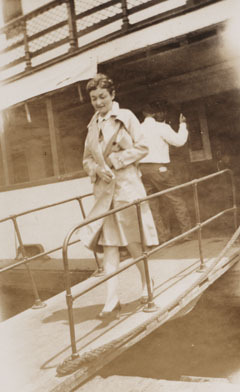 Her papers are housed at the Thomas Fisher Rare Book Library at the University of Toronto.